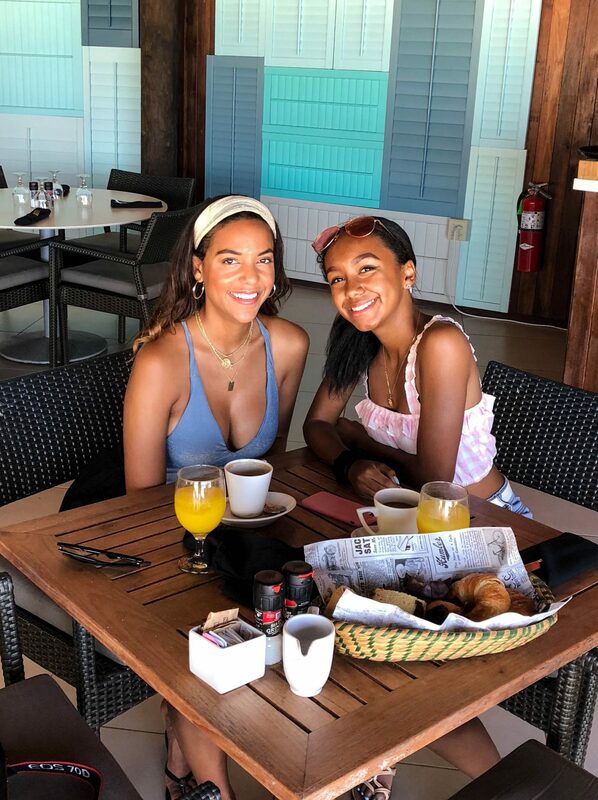 My little sister and I took a trip to Aruba and we had a blast together on the island. 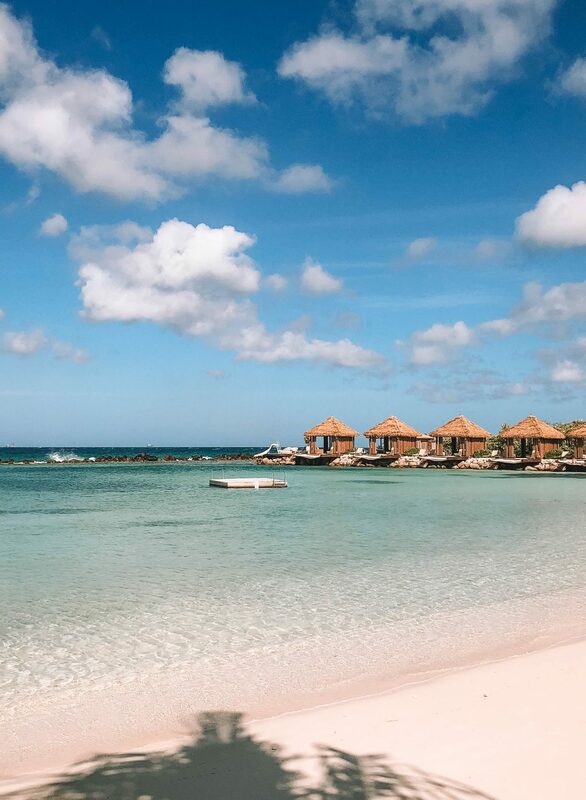 We quickly learned why Aruba is called the ‘Happy Island’ after spending a few hours in this tropical oasis. 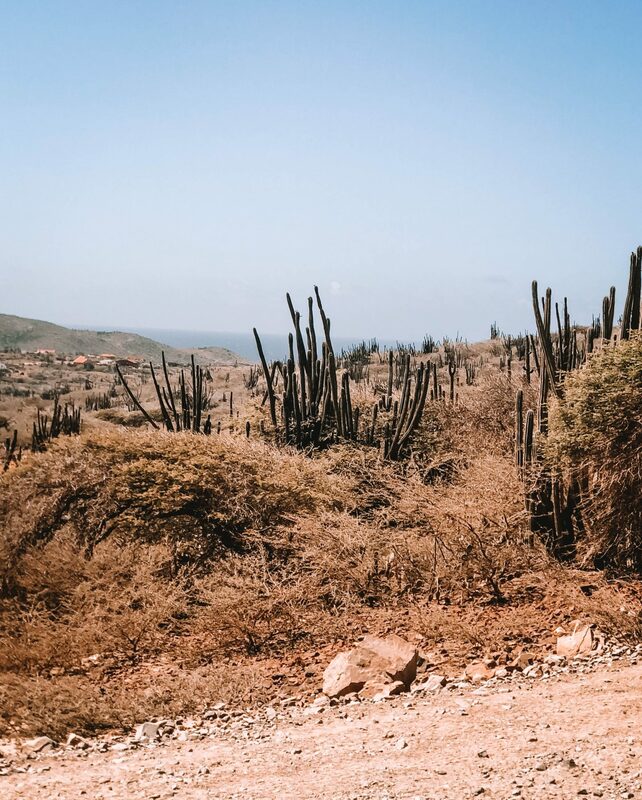 Aruba may have all of the characteristics of a Caribbean island such as soft white sand and turquoise water, but the arid temperature and abundance of cacti spread throughout the island create a unique experience unlike any other Caribbean island I’ve ever visited in the past. 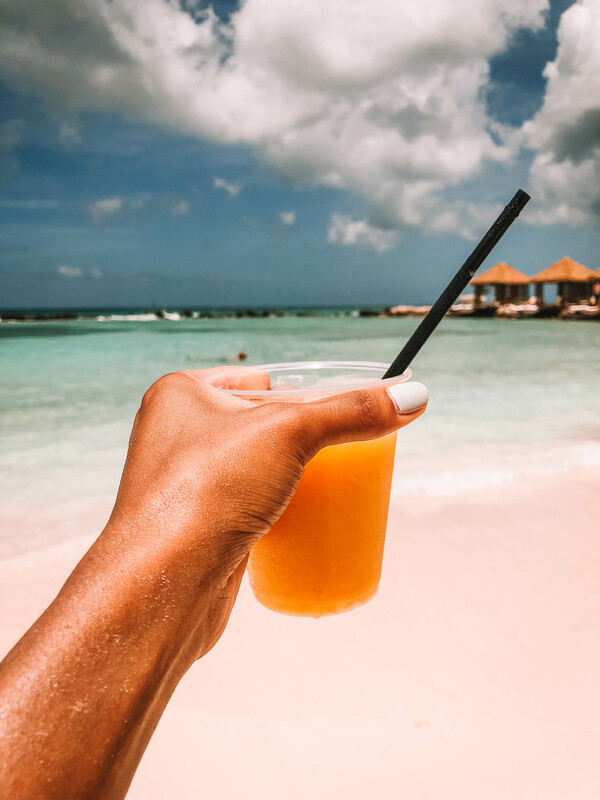 Even if you plan to travel to Aruba during off-season, you can expect extreme heat since the island is outside of the hurricane belt. 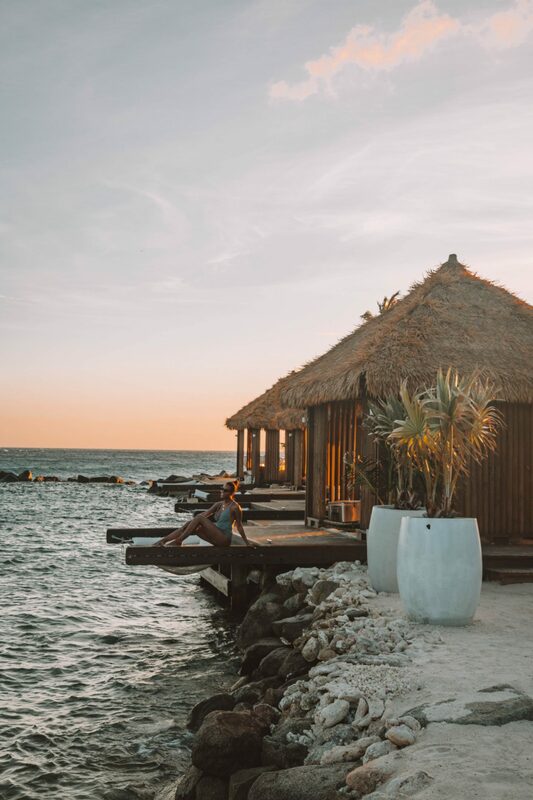 We booked a stay at the Renaissance Hotel for four nights, and I must admit I wasn’t thrilled about the accommodations but stayed there because I knew that the hotel offered unlimited access to Renaissance Island. 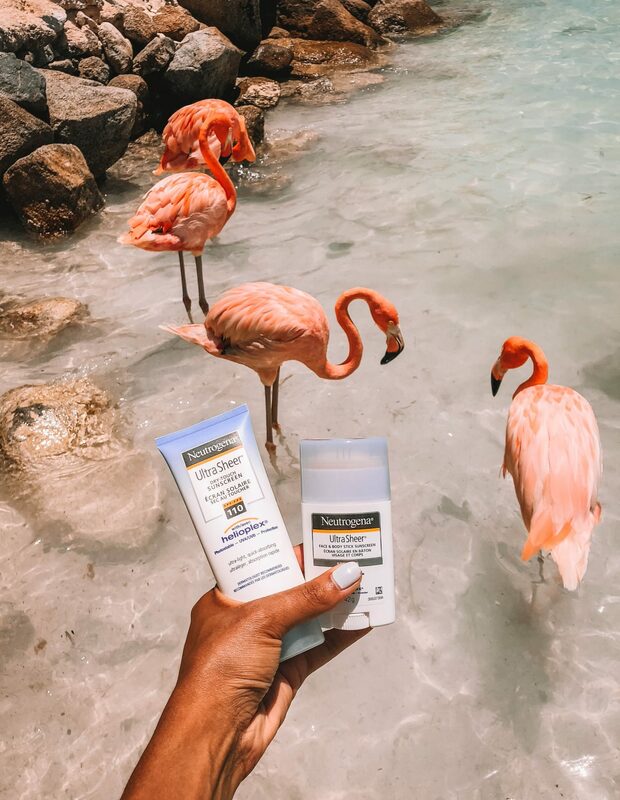 Renaissance Island is a private island that is home to the famous flamingos. 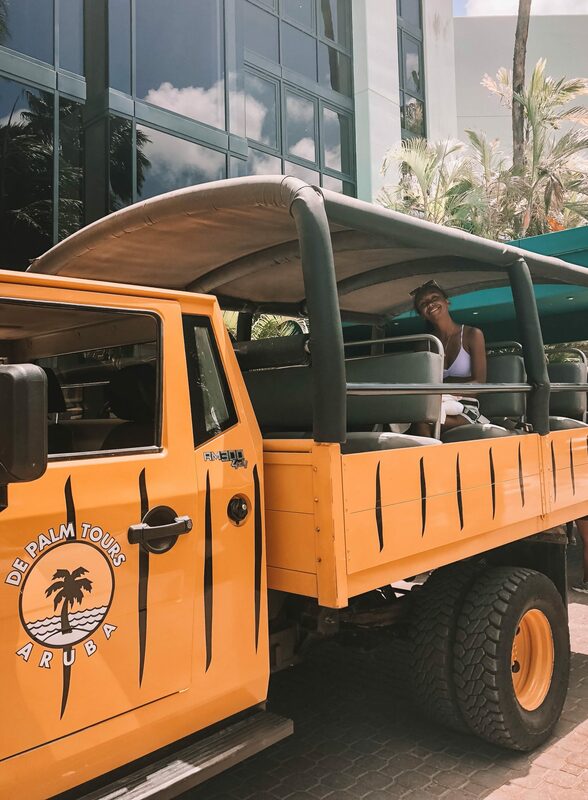 This island is accessible by boat, and hotel guests get free access to these taxi boats every 15 minutes from the main lobby. 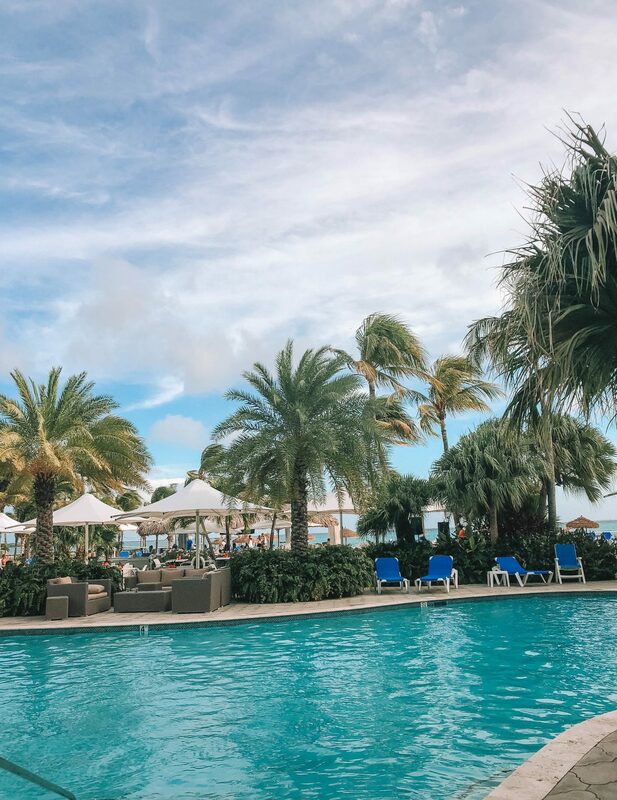 If you aren’t staying at the hotel don’t fret- non-guests still have access to the island by purchasing a day pass from the hotel for $100. 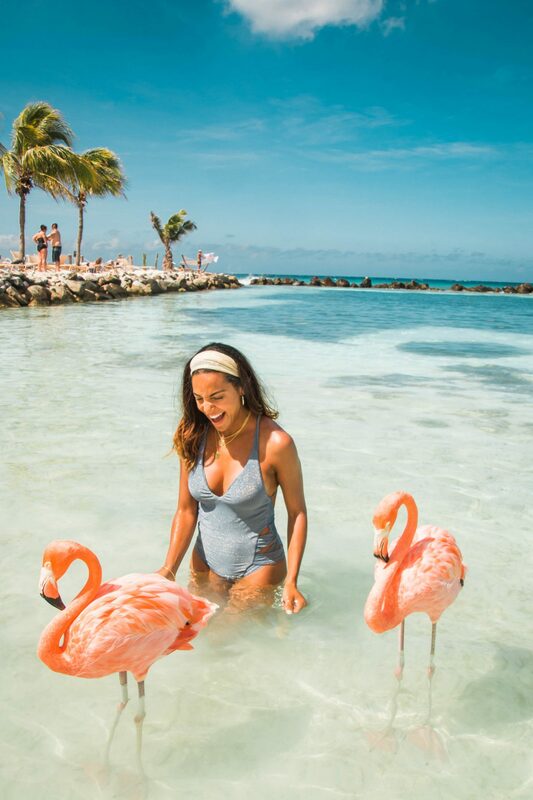 Please keep in mind the passes for Flamingo Island may be unavailable if hotel reservations are full. 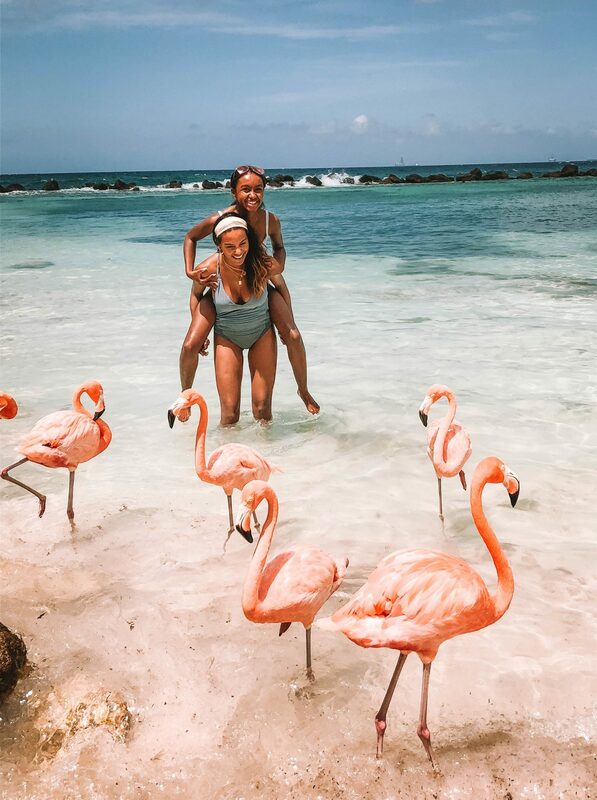 Renaissance Island is such a dream; however, if you’re going to Aruba in hopes of catching a glimpse of copious amounts of flamingos I’ll spare you the disappointment and tell you there were only about six flamingos on the island when we visited. Even though there were only a few of these majestic birds around, I still loved visiting the island and it didn’t take away from the magical experience. Renaissance Island has two different sides to the island. On one side of the island you’ll find the flamingos, and on the other side, there are tons of Iguanas. 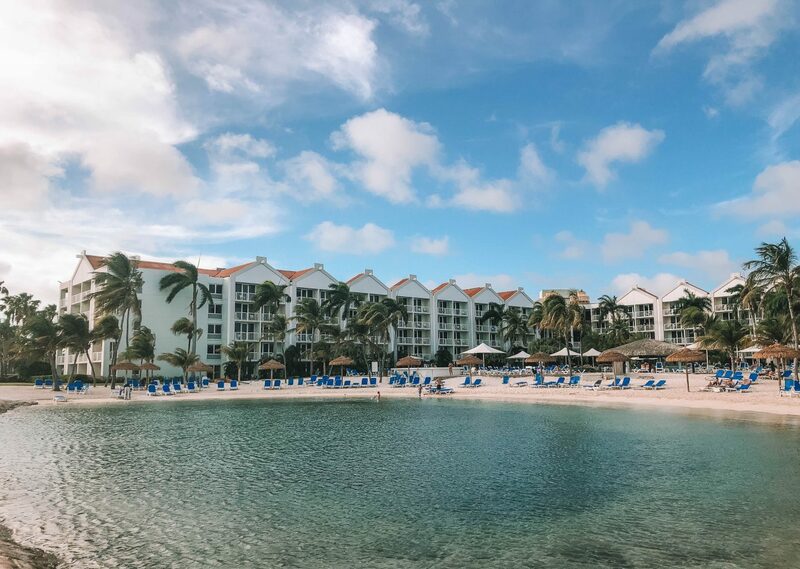 Iguana beach is the designated beach for anyone under 18 and Flamingo beach is for 18+ visitors making it an excellent escape for relaxation. 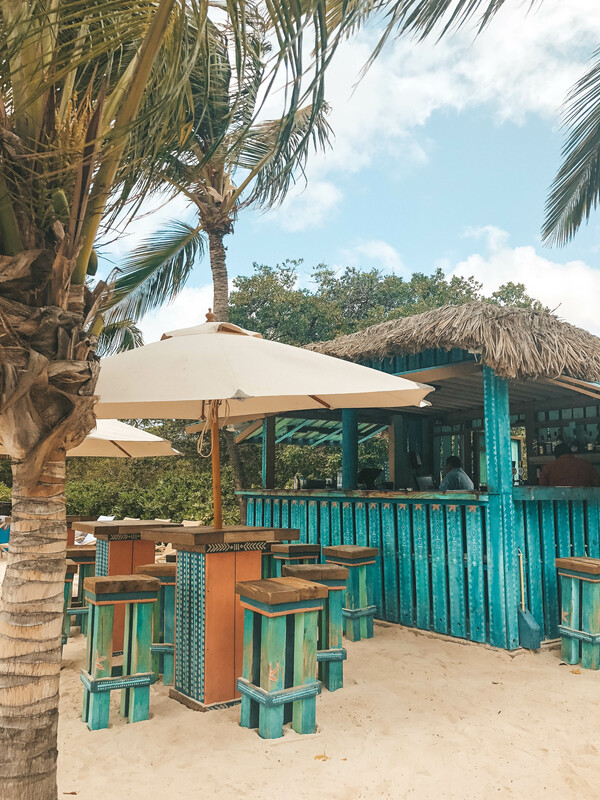 Each side of the island has individual cabanas available to rent for roughly $230 per day, but the Iguana side has a restaurant and the flamingo side, a bar. 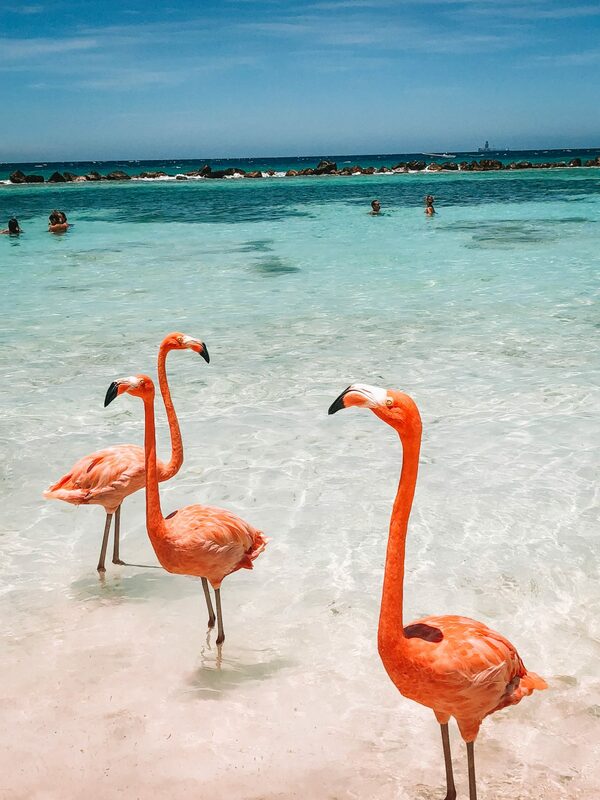 Flamingo Beach Tip: If you want to interact with the flamingo’s make sure you bring 25 cents to purchase flamingo food from the dispenser on the island. 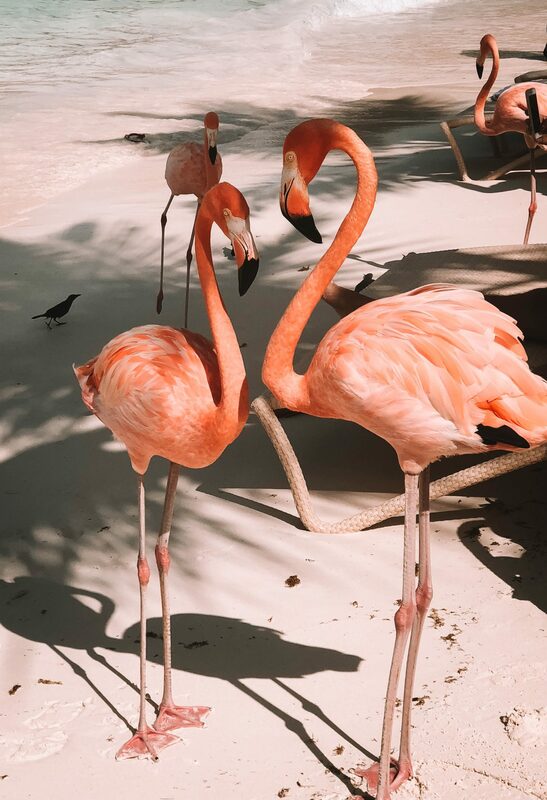 The flamingos are happy to eat the food directly from your hand and are more likely to follow you around when you have food for them to eat. However, be cautious these pink beauties do bite, but it doesn’t hurt- I had a love-hate relationship with them and ended up befriending one and named him Stewie. 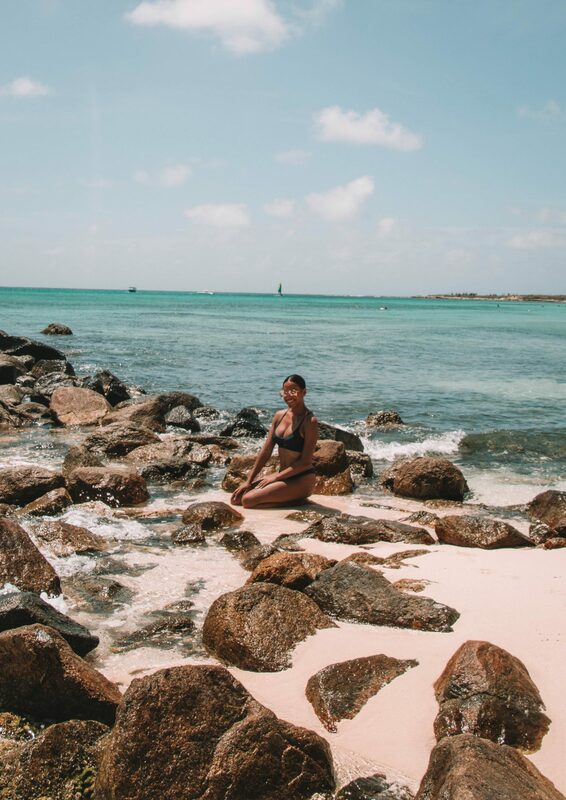 Another fun excursion to do, while you’re visiting Aruba, is take a bus or UTV tour to Conchi, the natural pool in Santa Cruz. 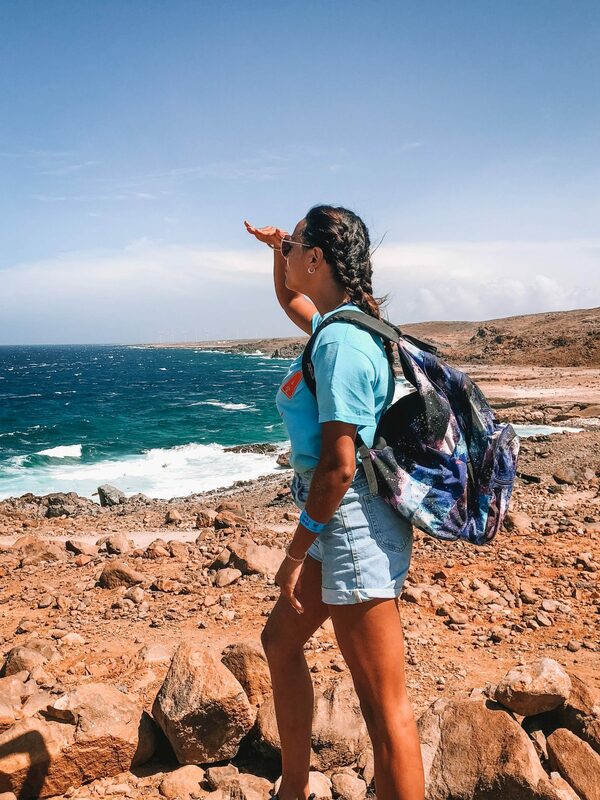 My sister and I took a bus tour with De Palm Tours, and it brought us to several beautiful sights in Aruba. 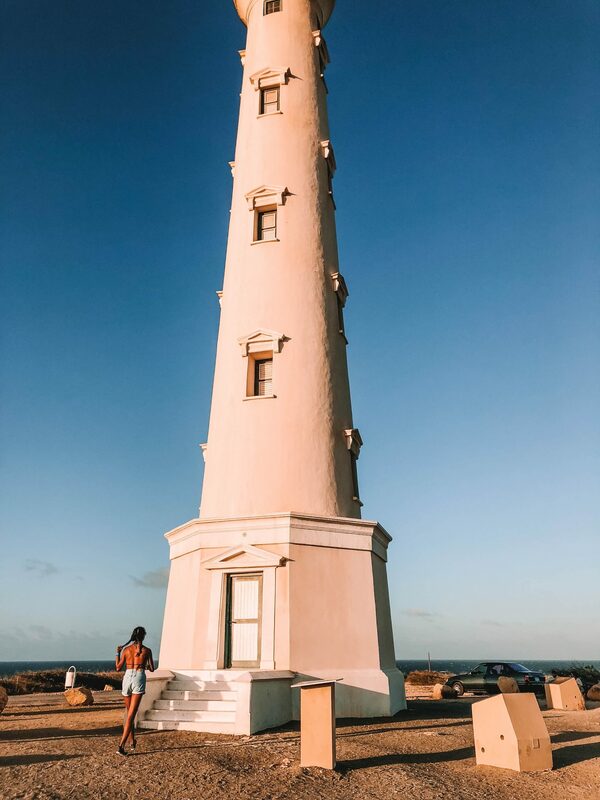 Some of the stops along the tour included a stop at Conchi but also stops at a natural bridge, the California Lighthouse, a gold mine and Alto Vista Chapel. 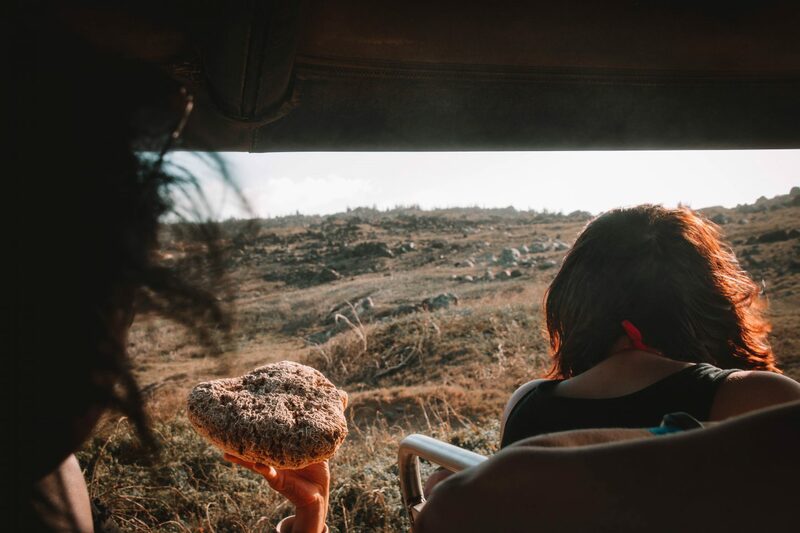 Talk about experiencing a bumpy car ride that felt like we were off-roading on this tour. We left in the afternoon and returned just after sunset. The trip is 4-5 hours long and worth booking if you’re interested in learning a bit about the islands history. 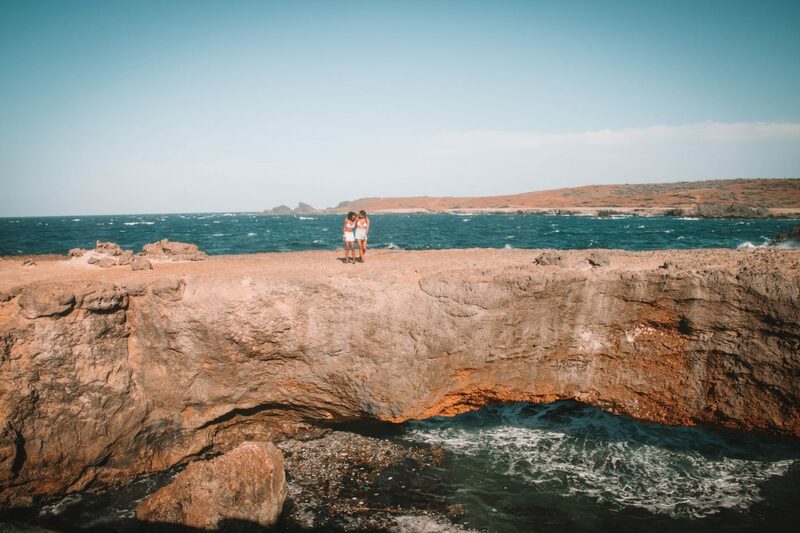 Our tour guide, Remy was the best- he was our makeshift dad for the day and made sure my sister and I stayed safe while swimming in the natural pool and hiking around the desert. Just a heads up the only food provided during this tour is a few small snacks so make sure you eat a large meal before you leave or pack food for the road. Also, remember to bring water, sunscreen, sunglasses (a ton of sand and heavy winds blow in your face), and water shoes. If I had the option of doing another tour to Conchi in the future, I would definitely do a UTV tour instead of the bus tour so that I could explore at my leisure and spend more time at each site. Since the beach at the Renaissance Hotel is rather small, my sister and I didn’t spend much time lounging around the hotel. 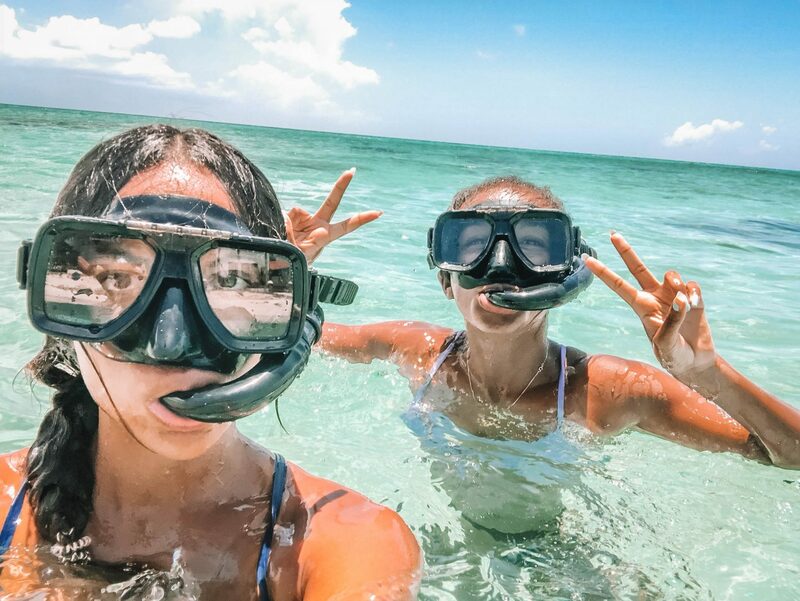 Instead, we went to Renaissance Island and explored other Aruban beaches. 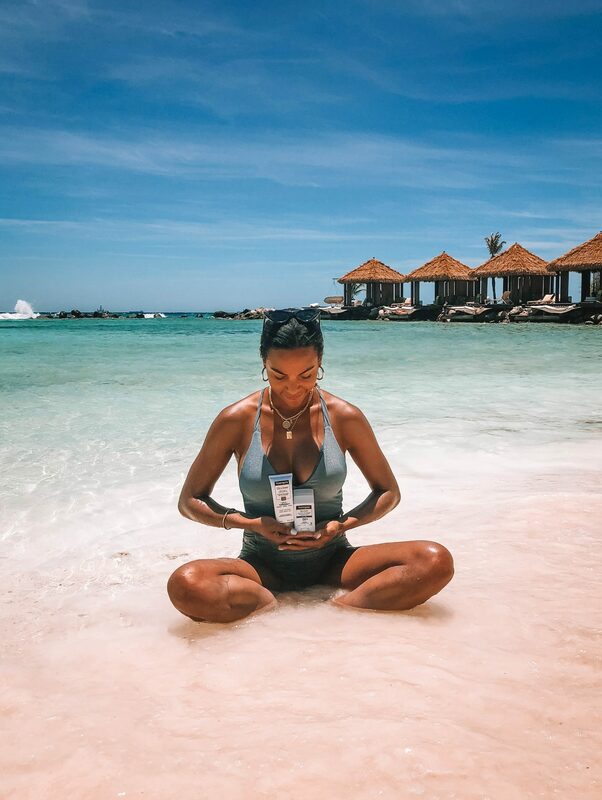 Aruba is home to several beautiful beaches including Eagle Beach which was voted the third best beach in the world in 2017. 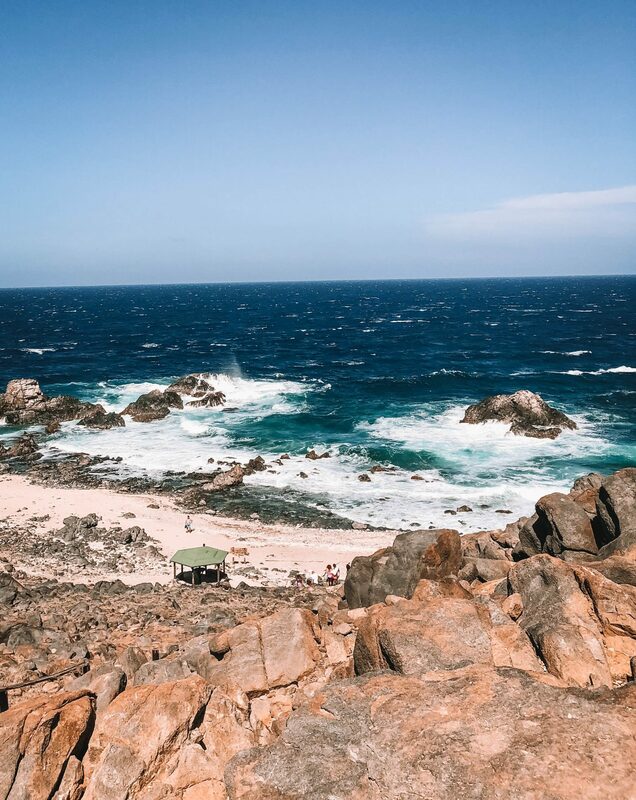 Though we didn’t get a chance to check out this famous beach, we did spend an entire day snorkeling at Arashi Beach which is a favourite amongst locals. 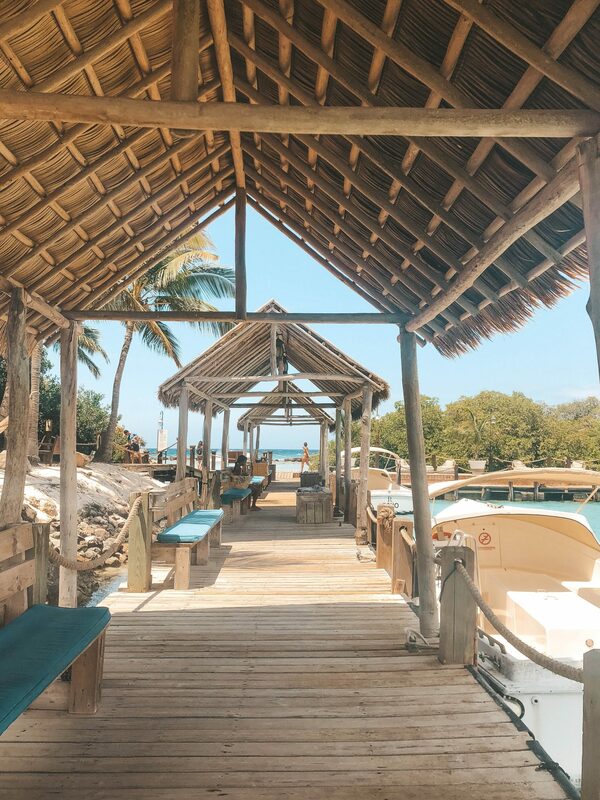 Aruba has a ton of delicious restaurants on the island, but one of my favorites was the Flying Fishbone. 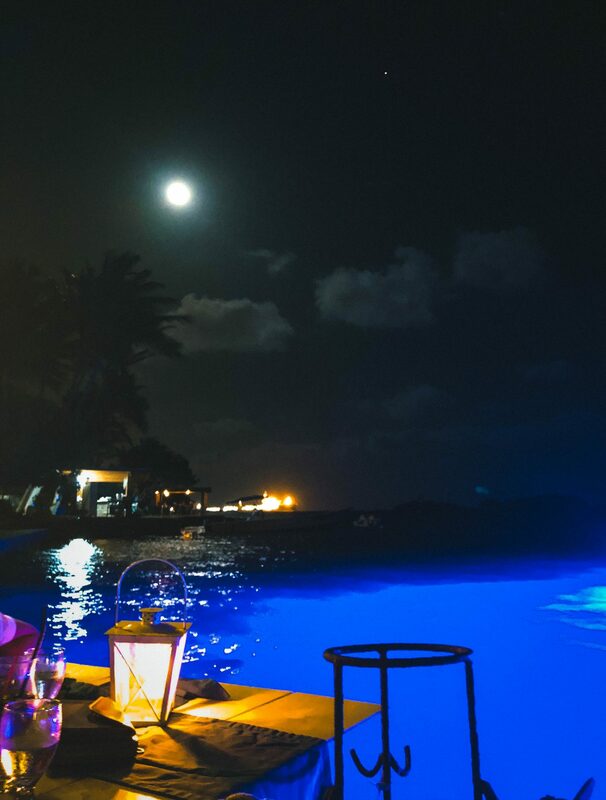 I highly recommend checking out this restaurant as the experience was truly unforgettable. 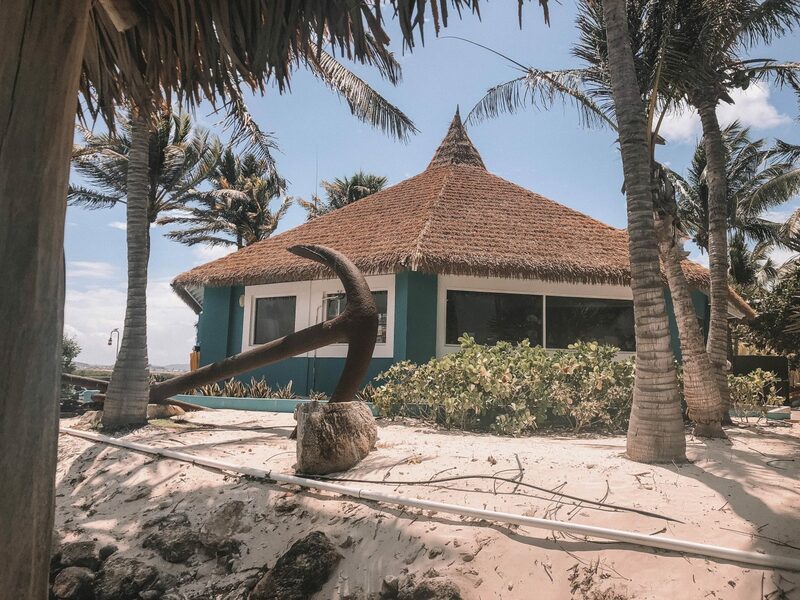 The Flying Fishbone is about a 20-minute taxi ride from the Renaissance and can get pretty busy during high season so make sure you make a reservation in advance. 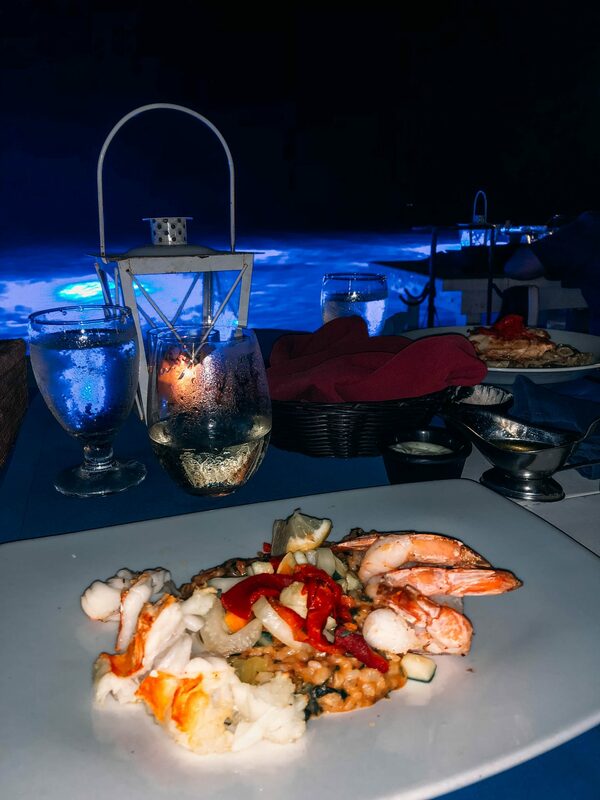 One of the main attractions of this restaurant is the fact that you can dine at a table right on the water. 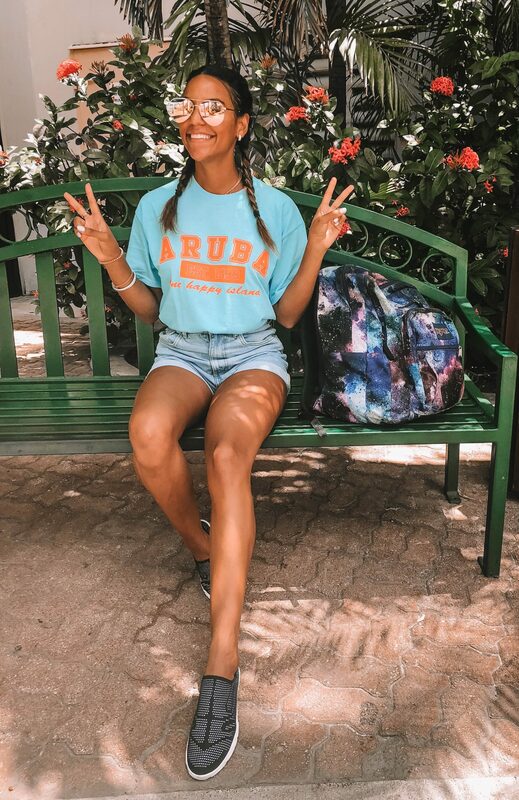 Aruba did not disappoint when it comes to shopping, and once I discovered there was no tax on the island, it was game over. 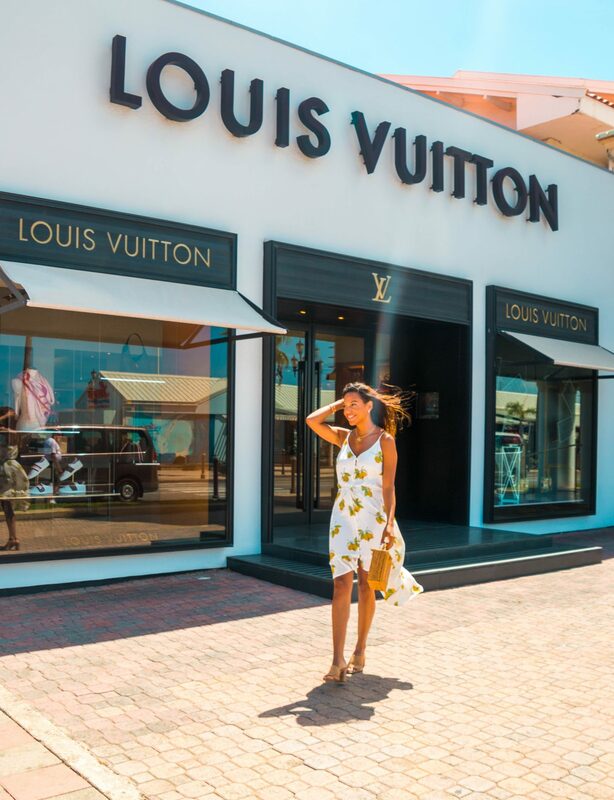 Most of the high-end shops like Gucci and Louis Vuitton are located in Oranjestad just steps away from our hotel. The surrounding streets are full of Dutch architecture and colourful buildings. 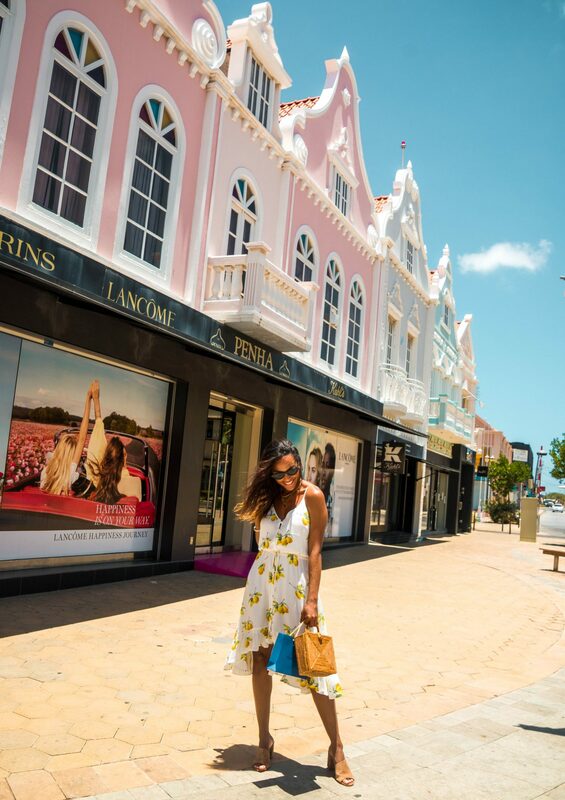 Even if you aren’t interested in shopping, it’s still worth exploring this area to see the Marina and Dutch influences. 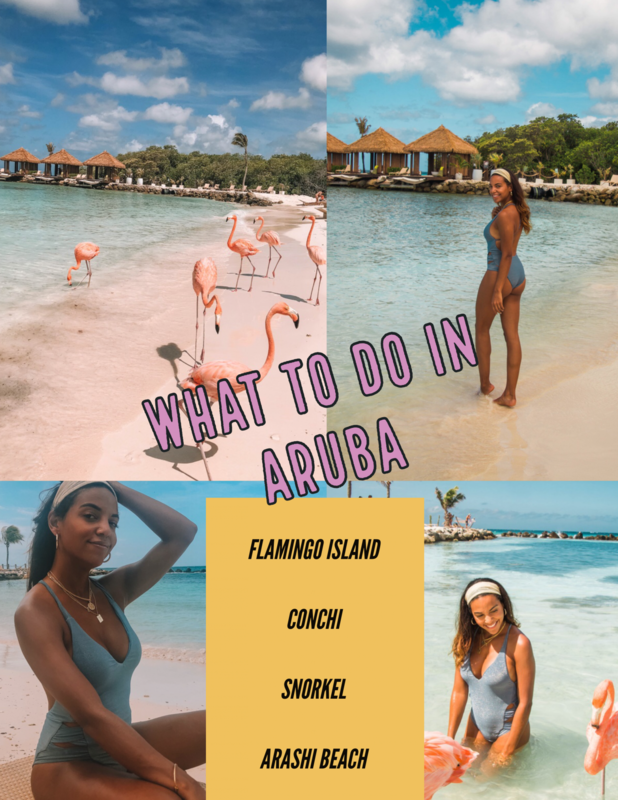 I honestly did not expect to love this island so much, but there was something about Aruba that reminded me of California which made me feel right at home. 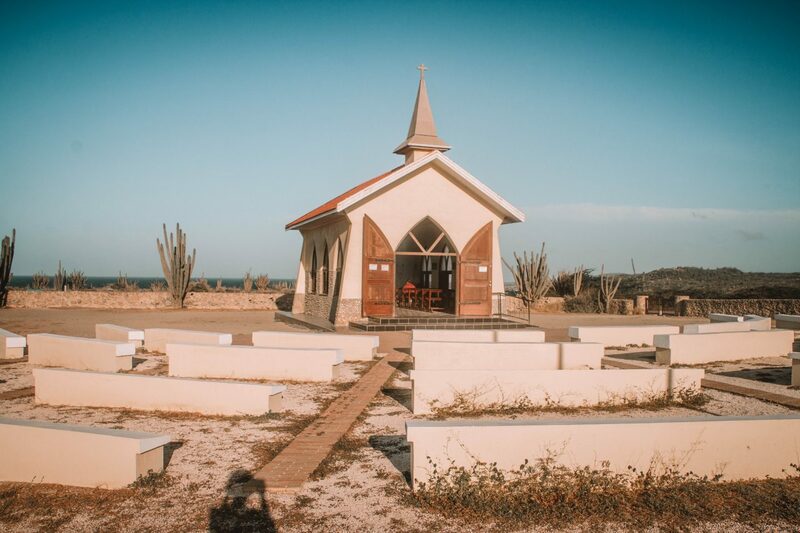 The locals were extremely welcoming, and I felt very safe exploring and walking around the island with my sister alone at night. 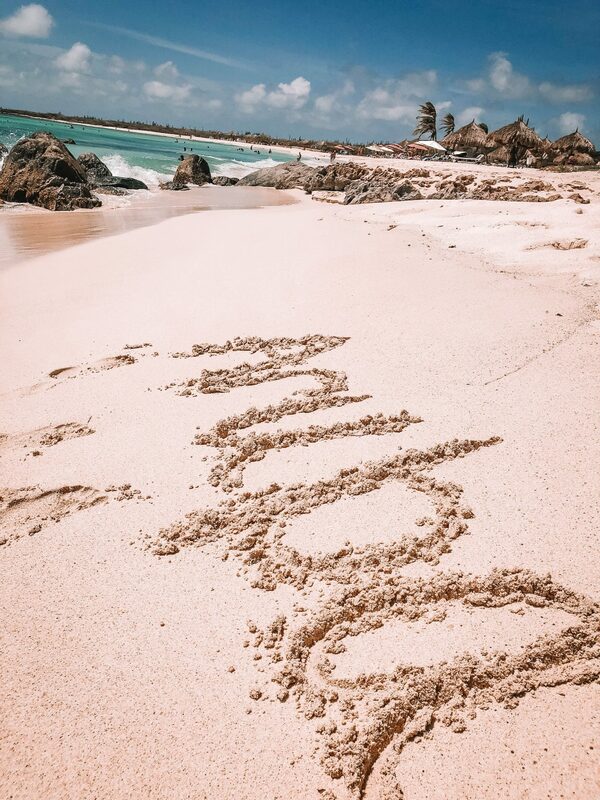 I can’t wait until the next time I can revisit Aruba. 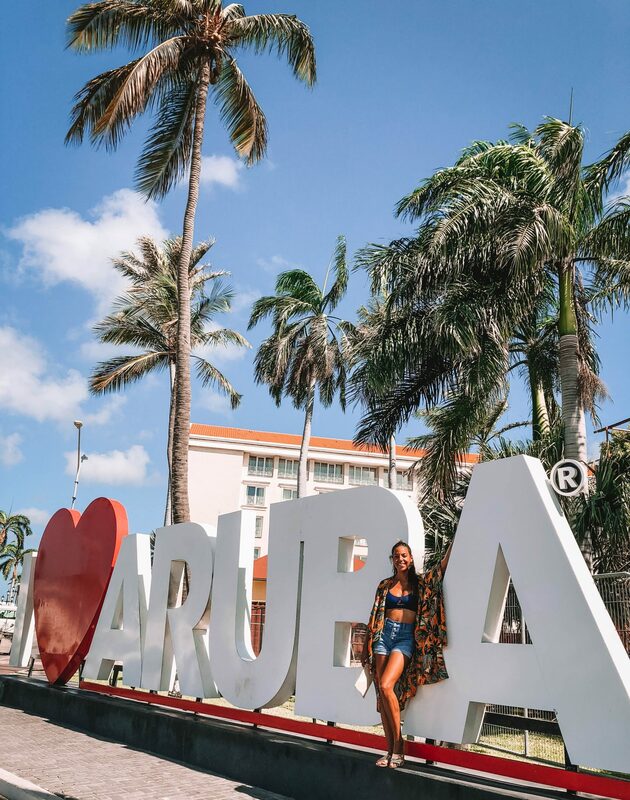 Have you ever visited Aruba? If so, what was one of your favourite things about the island? This looks amazing!!! I definitely need to plan a trip there! 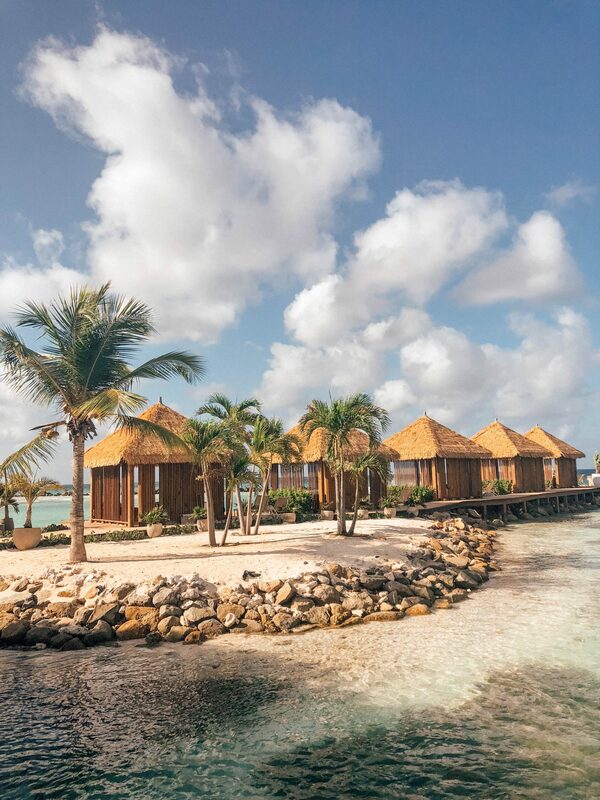 What a lovely paradise! Oh how I miss the beach. Love your photos dear!